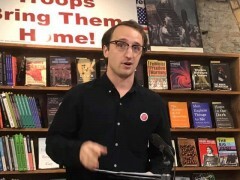 FRSO event on Marxist perspective of the U.S.-orchestrated coup attempt in Venezuela | Fight Back! Minneapolis, MN - On March 17, 50 people filled Mayday Books to hear Sean Orr, a Latin America solidarity activist, trade unionist, and member of Freedom Road Socialist Organization (FRSO), speak about the current crisis facing Venezuela. In a presentation entitled, "The U.S. Orchestrated Coup in Venezuela: A Marxist Perspective," Orr highlighted the leading role of the United States in the destabilization of Venezuela as well as its efforts to foment regime change. The United States has attempted to interfere in the political and economic development of Venezuela in a major way since oil was discovered in the country in the 1920s. After the election of Hugo Chavez as president of Venezuela in 1998, the U.S. has periodically intensified the hostile measures taken against the Venezuelan people. The most recent manifestation of this aggression began when John Bolton, President Trump's national security advisor, named Venezuela as a target for destabilization, along with Cuba and Nicaragua. This hostility continued with Trump's recognition of the reactionary Juan Guaido as the interim ‘president’ of Venezuela, the imposition of additional economic sanctions, material support for the political opposition, and a coordinated attack that left the country without electrical power for nearly a week. Orr explained that prerevolutionary Venezuela was plagued by economic and social inequality, and that the economy was oriented to serve U.S. imperial interests. "It's not hard to understand why the Venezuelan masses rose up and rallied behind Hugo Chavez in 1998," explained Orr, "They demanded a government that worked for them, not one that tried to appease them while working for foreign interests." Elaborating further, Orr explained that after the Venezuelan economy was reoriented to meet the people’s needs under Chavez, both the capitalist classes of the United States and in Venezuela consistently engaged in destabilization efforts in an attempt to undermine the national democratic Bolivarian Revolution. From the coup attempt against Chavez in 2002, to the price fixing by private enterprises, Venezuela's political and economic wellbeing was under constant attack. Orr detailed how the constant subversion of Venezuelan democracy continued after the death of Hugo Chavez and intensified after the election of Nicolas Maduro in 2013, stating, “The bourgeois opposition went on the offensive against Maduro from day one. It must be understood that the Maduro government has not known a single day of peace." In speaking of how Bolivarian Revolution continues to resist the efforts of the U.S. and the Venezuelan opposition, Orr said, "For the past 20 years, the country has been led by a mass movement, a national liberation movement, committed to sovereignty and independence from imperialism. The dogged commitment of the Venezuelan people to their own interests must be a great source of frustration for the bankers of Wall Street." Orr continued to emphasize that the society that is being built in Venezuela - one that meets the people’s needs and prioritizes the working class - continues to grow towards the establishment of socialism, with the development of workers’ communes and the Constituent Congress of the Working Class. It is precisely this development that draws the ire of the United States. Sean Orr is the main Venezuela correspondent for Fight Back!, a trade unionist, and a member of Freedom Road Socialist Organization. The March 17 event was organized by Freedom Road Socialist Organization – Twin Cities.